To a unique and exceptional experience that's fresh and new every time you visit. What goes on at Benihana? The meal begins with a delicate Japanese onion soup, followed by a salad with ginger dressing. The chef will prepare your chicken, beef or seafood, along with vegetables, hibachi-style on the sizzling grill surface. Be sure to enjoy the show, because Benihana chefs literally play with your food as they cook it. 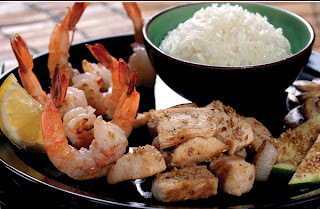 Your entrée will be served with homemade dipping sauces and steamed rice, or if you prefer, Benihana's mouthwatering Hibachi chicken rice. You may also order tempura, sushi and specialty rolls. Who can I bring to Benihana? Bring a friend, a date, your children, your whole family or your office gang — anyone who enjoys a delicious, freshly cooked meal with a little fun thrown in. 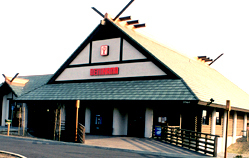 Benihana can accommodate groups of all sizes, and the more the merrier at the teppanyaki tables. Even if you come on your own, you can join others at the table for a fresh cooked meal and a show. Please call your favorite Benihana restaurant to reserve group dining.